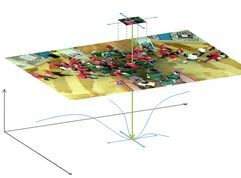 In order to obtain reliable empirical data of multi-directional, intersecting pedestrian flows for the evaluation of different simulation models, in 2010 we conducted human crowd experiments at the Technische Universität Berlin. One particular experimental setup in December, for example, arranged for two pedestrian flows (142 and 83 subjects) to intersect at an angle of 90 degrees for one minute in a region of about 25 square meters, resulting in peak densities of about four pedestrians per square meter. 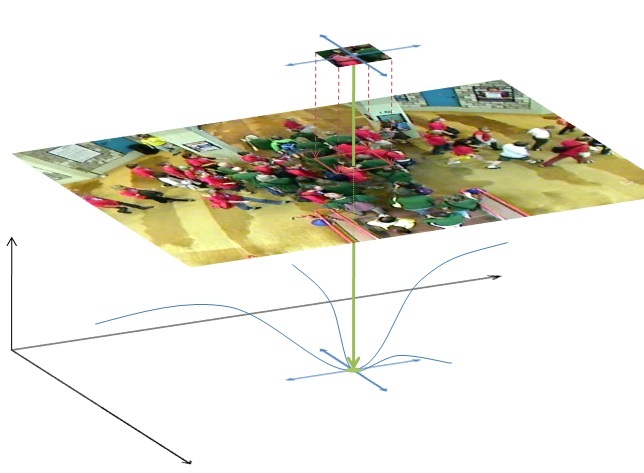 The pedestrians' spatio-temporal positions were obtained via photogrammetric means from video data recorded with multiple temporally synchronized network surveillance video cameras. Tracking of the pedestrians was facilitated with the standard Lucas-Kanade algorithm. In our case, a particular challenge was presented by the fact that due to constructional limitations the scene could not be captured from a bird's eye view. Thus the effect of the pedestrians' different heights could not be assumed as negligible - and since the pedestrians' heights were not known beforehand, we needed to devise a method for extracting the pedestrians' positions reliably without this information. Smooth trajectories were then obtained via approximation with cubic B-splines, and the combinatorial assignment of trajectories obtained from different camera perspectives was supported with the Kuhn-Munkres algorithm. After evaluating video data and obtaining suitable trajectories, we computed density fields. To our understanding for validation of different models the spatial density setting as a representation of pedestrian dynamics is very appropriate: Macroscopic simulations already provide density fields and those can be easily extracted as well from data which can be obtained from experiments and microscopic simulations. Yet local density fields have been determined by a nearest neighbor density estimator. Compared to those density estimators with fixed bandwidth, which are widely used in literature, calculates our new approach a density field which provides spatial averaged values over mesoscopic areas, what is more likely for counting pedestrians contained in a region of interest. Thus we obtain an estimator which (a) yields density fields that are also differentiable functions in time and (b) models the influence of multiple neighboring pedestrians on the space of an individual. Another approach for density estimators bases on Voronoi diagrams. The basic idea is to consider the personal space claimed by a pedestrian. This space corresponds to the Voronoi cell of a person respectively. The results of Voronoi densities are very similar to those of standard densities, however they have less scatter in comparison. Nevertheless also Voronoi based estimators do not provide locally smooth results. Naively calculated Voronoi diagrams possess several features which are inconsistent with the concept of a personal space, in particular the cells on the border of the diagram. Pedestrians who make up the convex hull have infnite cells, other cells maybe large but finite and many cells cross the boundary of the room. Therefore we extend the concept of Voronoi densities by limiting the cells to maximum radius and cut with the room geometry.